Engaging with the argument that gamers are our future feels a bit like a game itself. It’s one in which I pit my wits against the California-based alternative-reality guru and academic Jane McGonigal and her characters, the Super-Empowered Hopeful Individuals, while she tries to slay my avatar, the cynical layman reared on English circumspection and gloom. It might not quite be Mortal Kombat, but McGonigal’s treatise is an epic read and, as a non-gamer, I am a prime target. 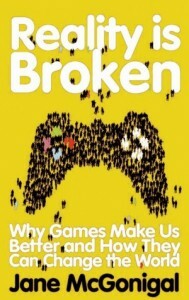 The book describes the kind of experience gamers get from virtual worlds, such as that of the interstellar wargame saga Halo, and the all-encompassing, inclusive feeling that people need from real life. That they aren’t getting the latter is in part, the author believes, because of a focus on extrinsic rewards that promote an inward spiral of unhappiness. The gamer response to this epic fail is to surmise that reality is broken. Of course, rebooting is not an option. McGonigal argues that subsequent immersion in alternate realities is something that can be harnessed for the collective good, and that the collaborative aptitude of gamers is a raw material waiting to be mined. Regular gamers number 183 million in the US, 200m in China, 105m in India and 100m in Europe, of which 30m are in the UK. These gamebots have collectively chalked up 5.93 million years playing World of Warcraft. For Halo, they built a “wiki” site on a scale that suggests they could easily put together more obviously useful ventures such as “crowdsourcing”, a method that was used in the UK to build a fuller picture of the MPs’ expenses scandal. While she doesn’t dwell on negatives, McGonigal does qualify each example at least enough to recognise that the nerd army hasn’t reached the promised land. However, she does believe that their habit of using positive thinking to overcome voluntary obstacles will prevail, and therefore they are not all desiring of being criminals-in-training, a la Grand Theft Auto. Before doubt can take hold over the possible socialising effects of Farm ville, McGonigal opens new portals, including a glimpse of the Gates Foundation-funded Quest to Learn school in New York, where lessons are played out as short challenges to reach clear goals and the emphasis is on completion rather than a simple pass or fail. Elsewhere, games fold proteins or engage the elderly in care homes. Such are the extremes of opinion in my mind that I am awed by the idealism while also believing that Reality is Broken could be an hour-long comedy show at the Edinburgh Fringe Festival. The latter view is fuelled by games such as McGonigal’s own Cruel 2 B Kind, which uses mobiles and social networking to reward random acts of kindness with points – behaviour that is supposed to spill over outside the game’s boundaries. Other shiny, happy examples also provoke snorts of derisory laughter, but the underlying message is clear: gaming is good and gamers are benevolent. When those who feel that society is broken consider the forces behind it, be that government or commerce, they might not be blamed for wondering if there is indeed a new game in town. This may sound like the elusive Third Way, and it certainly has implications for the proposed Big Society, as well as for the increasing power of online protest organisations. Ultimately then, I’ll play; just don’t expect me to take it seriously. Maybe that’s the key to how it will work.